Prolonged American deployments in both Iraq and Afghanistan have crippled the country’s ability to quickly respond to emerging threats and situations elsewhere in the world. Sheer logistics aside, the same stubborn logic that has maintained an American presence in Afghanistan would also preclude its redeployment on the grounds that American troops are vital to winning the hearts and minds of the Afghan War. But what happens when that might mean missing a genuine opportunity? The regime of Muammar Gaddafi, longtime sworn enemy of the United States, is in the midst of a particularly brutal crackdown against what appears to be a genuine democracy movement in that country. He has vowed to die a martyr, and what were peaceful protests have spread into legitimate civil war throughout the country. The arguments against intervention in Libya are many, and are valid concerns. American officials – Robert Gates most prominent among them – have been offering constant reminders that establishing a no-fly zone in Libyan airspace would be more complex and dangerous than is casually thought, and the next steps – the exit strategy – have yet to be fleshed out. (The question of international law seems somewhat less damning as Patrick Porter suggests – the Arab League and Libyans themselves have called for such a step to be taken.) But unlike the Bush-era misadventures in Central Asia, commentators are actually thinking about those issues now. Such a commitment as the United States might undertake in Libya requires careful thought. But it requires more than just talk, too. Who would such an intervention be supporting, exactly? What if the rebels lose the civil war? Will the presence of ground troops be established? These are all questions that need answering. But here’s the other crucial difference between the catastrophic error in Iraq, the open-ended disaster in Afghanistan, and this situation – Libyans are asking for it. Libyan officials who have dissolved ties with the Gaddafi government – including Justice Minister Mustafa Mohamed Abud Al Jeleil, Interior Minister Abdul Fatah Younis, and the Ambassadors to France, India, Poland, Sweden, the EU, the UN, the Arab League, and the United States – are echoing calls for a no-fly zone. The governments of Britain, France, Portugal, and the Arab League have all recognized the National Transitional Council as the legitimate governing body of Libya. Who’s more deserving of American military backing: an Afghan government that enjoys the support of neither its people nor the United States, in a country filled with people just waiting for American troops to leave, or those revolutionaries trying to overthrow Gaddafi in their quest for democracy? Even if the United States were to adhere to the coldest realpolitik calculation, in this case the devil we know is diabolical indeed. Gaddafi is responsible for the Lockerbie bombings, for attempting an enrichment program, and is guilty of the most horrific crimes imaginable against his people. It would be difficult to find an even worse devil. And even in that case, isn’t it time to pick the one that actually matters: democratic or US-friendly? By not articulating – or proving through its own actions – just which one is the driving force behind American foreign policy, the United States continues to look weak, ineffectual, indecisive, and hypocritical to the rest of the world. And it’s that kind of ‘soft power’ that it can ill-afford to lose. Then again, the most justified intervention would probably be in Cote d’Ivoire to remove Laurent Gbagbo. That country, after all, has already held free and fair elections that ousted Gbagbo from the presidency. But Gbagbo has refused to step down, precipitating a civil war. It’s apparent that things have gotten out-of-control bad when refugees are fleeing into Liberia. Limited resources require prioritization. And it would appear as if America is focusing all its time and energy, its blood and treasure, on precisely the wrong theaters. Even when Afghans aren’t actively hostile to the American presence in their country, they’re not enthusiastic about it either. The waiting game is on. Whether the United States pulls out of Afghanistan in six months or six years, the situation there won’t change. Only the cost will. Those who aren’t asking for help don’t need or want it. Those crying out for it surely do. When you have several [intelligence] battalions working this system, it is of course most expensive in terms of man hours. But except against the most highly skilled gang, success is only a question of time. What we are after is not the pistol hidden under the car seat, or explosives in the bicycle pump. It is the man with it who can ‘help the police in their enquiries’. Weapons talk, but nothing like its owner. – Major-General Sir John Willoughby, “Problems of Counter-Insurgency in the Middle East,” The RUSI Journal 113:650 (1968), 108. National opinion is perhaps hardening against us. Every so often, I will have a mild revelation and ask myself, “Why are we still in Afghanistan?” It’s similar to the mental whiplash I developed in the run-up to the Iraq War, when all of a sudden the national conversation switched from one about Osama bin Laden, Afghanistan, and Tora Bora to yellowcake uranium and l’Affaire du Plame. Leaving Afghanistan would mean that the Taliban would officially take over the country – most of which they already control. So what? It has controlled Afghanistan before. America is under no moral or political obligation to re-make the country into some sort of “democratic” state. It would make it easier for Pakistan to deal with both its internal radical Islamic threat and with a Taliban-controlled Afghanistan (which Pakistan knows will be the end result of the war). Difficult as it is for us freedom-and-democracy-loving Americans to admit, free elections will not be how the war in Afghanistan ends. Perhaps we are under some sort of moral obligation to attempt to stabilize the country, having brought war and destruction to it, but we’ve had nine years to work that out, and failed miserably. There are no positive outcomes. The only question is whether the Taliban returns sooner or later. And the longer we wait, the more it costs us. Your depressing thought for the day. 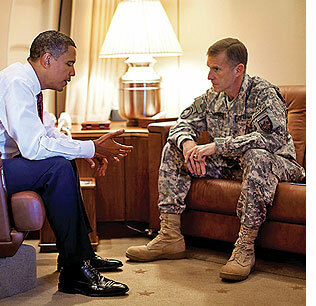 President Barack Obama meets with General Stanley McChrystal aboard Air Force One. I’ve refrained from commenting on the McChrystal piece in Rolling Stone, mostly because I think the entire affair is somewhat overwrought, but also because I see both sides as being wrong in a way. Most importantly, of course, is the need to preserve a proper respect for the Office of the President and the civilians who control the military, but it remains to be seen whether that can occur even if the kind of banter thrown around by General McChrystal’s staff remained off-the-record. People say stupid things, but usually they remain unknown. That’s really where McChrystal and Duncan Boothby went wrong. MacArthur he ain’t, but neither is he some kind of modern-day Eisenhower. Then again, can you show this kind of disrespect for your civilian leadership and still effectively prosecute the war? I don’t know (though it seems doubtful), and apparently President Obama thinks not – hence the abrupt end to McChrystal’s command and his replacement by General David Petraeus, who seems a rather inspired choice in lieu of General James Mattis. It ensures that some form of COIN will remain the dominant strategy, but also allows for a significant shakeup in staff (and paves the way for someone else to take over for Petraeus relatively soon). Still, another summer with yet another commander could even jeopardize the entire effort in Afghanistan. McChrystal is dressed down to the level of the troops, to distance himself from the commander in chief. He is a warrior, doing things civilians don’t understand. It’s not a fake pose. The Rolling Stone piece describes how McChrystal goes out on “dozens of nighttime raids” himself, going bravely into danger with the men he commands. But it’s the wrong pose to take. America is nearly 40 years into a bad and corrupting arrangement, in which ordinary citizens—including me—don’t have to be responsible for fighting wars, and Congress doesn’t have to be responsible for starting wars, and the military is a professional caste apart. McChrystal is a product of this era of eroding authority. Nobody knows more than the Army knows about the Army’s business. Bidding farewell to Stan McChrystal is probably the right thing to do here. And hopefully this culture of disrespect hasn’t extended itself too deeply yet. Military operations can only contribute when they are part of the broad plan for the re-establishment of Good Government right across the field of administration. And because the services are as a rule only brought in as a last resort and late, they are so often the only framework on which to re-establish Good Government. As true as it ever was.